For questions about SquadLocker or gear orders please contact SquadLocker support here. SportsEngine's integration with SquadLocker makes it easy for your team to order custom gear, shipped to their door in 2 weeks or less. Stores never close and there are no minimums. Create a store and customize your product selection in just a few clicks, then promote your store via your SportsEngine website, email, or social media. SportsEngine and SquadLocker will take care of the rest. SquadLocker stores can also be created for individual teams from TeamCenter. Step 2: Select Promotion, then choose Custom Apparel. Step 3: Upload your Logo and select team Colors to personalize your gear. Step 5: Click Create Store. This will generate your team's store within SquadLocker . Once you have created your SquadLocker team store, you will want to adjust the store settings. 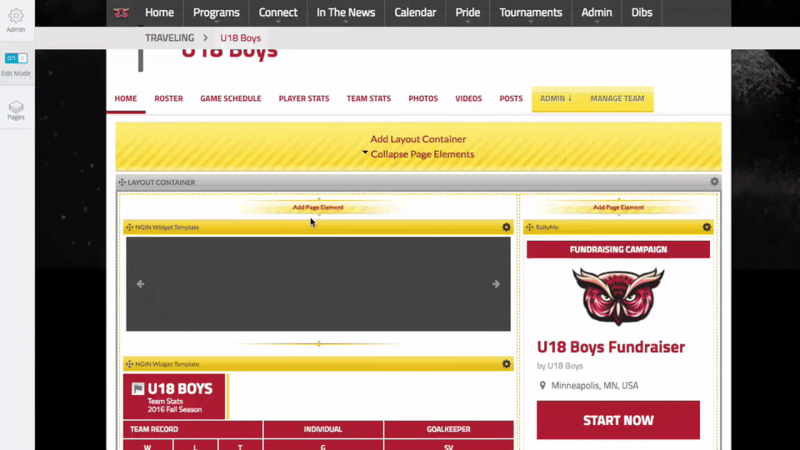 Add gear, colors, logos, fundraising, load your roster, and more. To get to the store details page, click Edit Store. From the Details tab you can verify that the team name and sport are correct. Go to the Fundraising tab to choose your preferred percentage for fundraising. This will automatically mark up the price of all items in your store by the percentage you select. Checks are mailed to you on a monthly basis. You also have the option to add your Roster's contact details under the Roster tab. Members that you add under the Roster tab will receive automated emails announcing the team store grand opening, as well as occasional gear specials or store promotions. Roster information is kept confidential, never shared, and is used only for store-related announcements. Step 1: Click Add Page Element. Step 2: Scroll down and select the SquadLocker page element. Step 3: Enter your Store ID and click Create This Page Element. Where can I find my store ID? To find your store ID go to the My Stores tab of SquadLocker or click here. From there you will find your stores listed on the left with the store ID # next to each.